New Delhi: Kashmir is considered to be a treasure trove of arts and crafts. While every region tends to have its own distinct specialty, Kashmiri carpets, shawls, papier-mâché objects and silverware are recognized worldwide for their fine quality and craftsmanship. Carpet weaving is not indigenous to Kashmir and is thought to have been introduced there by Persian settlers. 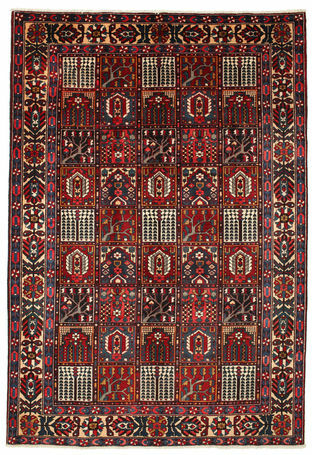 These settlers brought with them the knowledge of patterns and designs distinct to their communities, which is why many Kashmiri carpets carry motifs that are distinctly Persian, with some local variations. The Bakhtiari design, also known as the ‘paneled-garden design’ is named after a region in Iran called Bakhtiar. The field of the Bakhtiari carpet is divided into compartments or panels, containing individual motifs or patterns. Often a set of 3-4 compartments is repeated throughout the field. While the design may have originated in Bakhtiar, it is an often identified design in Kashmiri carpets. The paisley design is said to have got its name from the shawl manufacturing town, Paisley in England. Also known as the Boteh or pine motif, it is believed that it first used in Kashmir during the seventeenth century. The pattern can be traced back to ancient Babylon, where a tear-drop shape was used as a symbol to represent the growing shoot of a date palm. The palm provided food, drink, clothing (woven fibres) and shelter, and so became regarded as the ‘Tree of Life’. 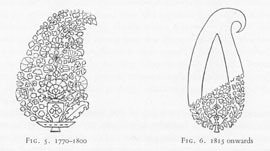 Other theories state that the motif is a stylized depiction of a mango, a fruit commonly found in India. Shawls from Kashmir have always been the most sought after for being woven from hair, and being lighter and smooth with a natural sheen. Silverware and papier-mâché are two other equally popular items that Kashmir is known for. 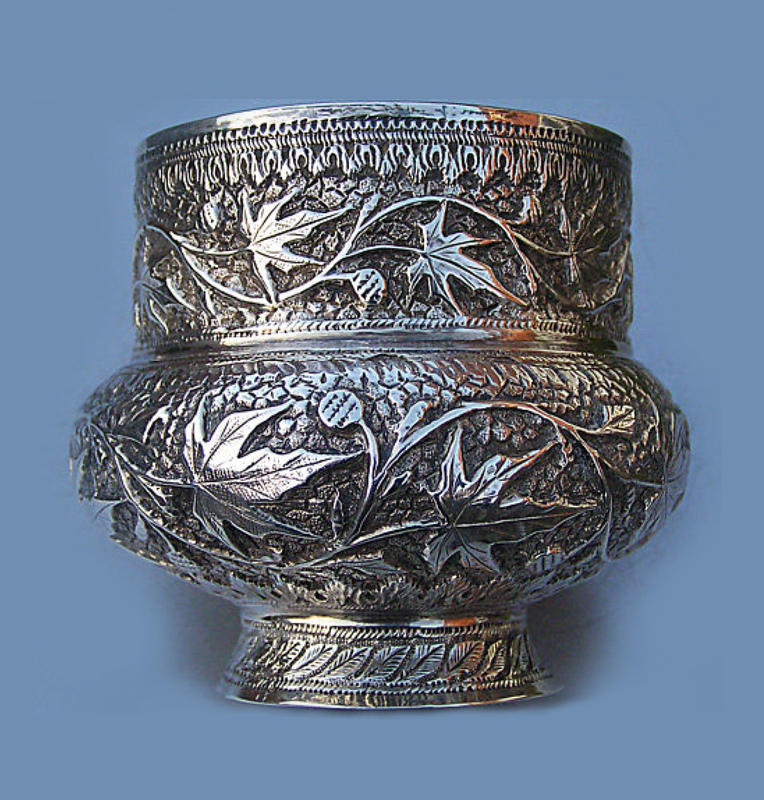 Local silversmiths incorporated the Chinar-leaf design into silver objects. Called booune in Kashmiri, the chinar tree came to Kashmir in the sixteenth century when Emperor Akbar arranged for the planting of several hundreds near the Hazratbal shrine. It is said that when the leaves on the trees turned red, the emperor saw them from a distance and exclaimed, “Chin-nar!” which means blazing colour. Papier-mâché was also introduced to Kashmiri craftsmen by Persian settlers. Initially used to make boxes to transport expensive shawls to Europe, Kashmiri papier-mâché was so loved in countries such as France, that it started selling on its own. Today, it has become highly stylized with the use of real gold and silver paint, and by adding intricate decorations. The designs and decorations still have a strong Persian influence. Some items like bowls and vases are lined with brass, while some exquisitely carved items are ornamented with gold and silver leaf and depict beautiful landscapes and objects like house boats, that are an integral part of Kashmiri life. kashmiri craft is world famous and also kashmir houseboats. Kashmir houseboats are associated closely with the valley’s culture and traditions. A brilliant idea that started from constructing small boats was later revolutionized with transforming these boats into spacious modern styled floating hotels. houseboats are all made of the finest cedar wood that follows with intricate walnut wood carvings, paneled walls and tiled baths. Our boats are categorized in the super deluxe category and each boat has an assorted number of three to four bedrooms with a private bath and wash room.